The manor of Wickham Bishops was recorded as belonging to the Bishops of London in the Domesday Survey of 1086 and it is possible that this church was originally constructed as a private chapel for the use of the Bishops when staying in the manor. The church is built of a mixture of flint rubble, boulder clay, puddingstone, septaria and pillaged Roman tile and brick. It dates in the main from the 12th century and consists of just nave and chancel, the former having a 15th century south porch. There is a small western cap which is all that remains of a short broach spire that collapsed before the Friends took over the building. By the mid 19th century the church was in a poor condition and badly sited for the community it then served, and it was decided to replace it with a new building higher up the hill. This was built in 1850 to the designs of Ewan Christian. The font, holy water stoup and parish chest were all removed to the new church where they may still be seen. Although it remained as a chapel of ease to the new church, Old St Peter’s fell into steady decline and was threatened with demolition on more than one occasion. After 120 years of decay it was declared redundant in 1970. The founder of the Friends, Ivor Bulmer-Thomas, instigated an appeal which resulted in our taking responsibility for the building in 1975. The building was tidied up and the chancel windows installed, but vandalism was to play a major role in slowing down our work over the next ten years. In 1994 the Society was approached by Benjamin Finn, a local stained glass artist, who expressed a wish to use the church as a studio. This seemed an ideal way to combat vandalism and repairs were carried out to make the building weatherproof and suitable for its new use. 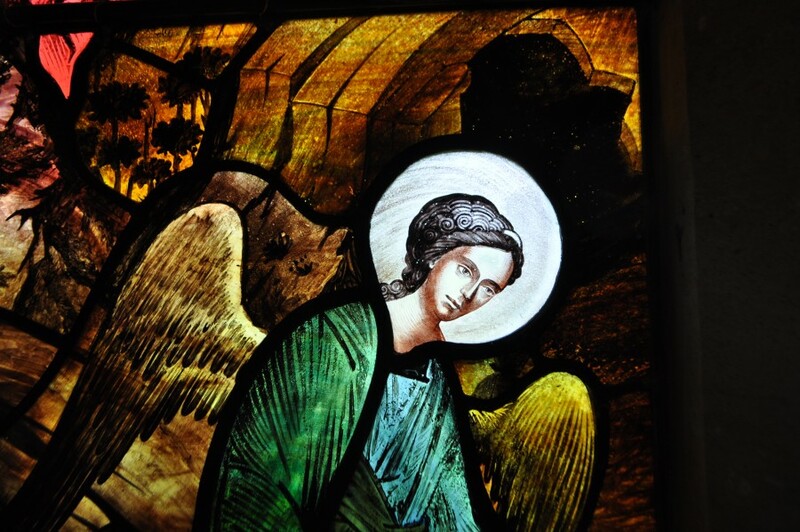 Click here for more information on Benjamin Finn, at the the Stained Glass Museum in Ely. Of particular interest is the way in which the windows have been reglazed in oak tracery, designed by Julian Limentani, instead of trying to replace the original stone mullions. The work carried out – largely at Mr Finn’s own expense – is all reversible and preserves the character and archaeological interest of the building whilst allowing it to be given a new lease of life.